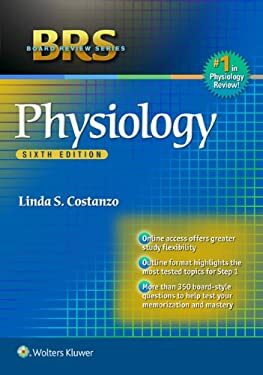 Written by well-regarded physiology professor, Linda S. Costanzo, this revised sixth edition provides an excellent physiology review for students preparing for the USMLE Step 1. The book concisely re views key physiology principles and includes clinical correlations to emphasize connections between physiology and clinical medicine. You will discover: New! The book has been updated throughout to reflect the latest developments in the field and students reviewer feedback, New! Many new and revised questions have been added, including more clinical vignette USMLE-style questions, Each chapter is written in the popular Board Review Series outline format and features bolded key terms to streamline your study, Over 350 USMLE-style questions, answers, and rationale electronically and in print reinforce your physiology review, A companion website offers the fully searchable text and an interactive question bank with all the questions from the book so you can customize your review tests! Book jacket.